I encourage you if you are considering buying, selling, or renting in the next six months or so to call me now (301-452-1409) as the predictions are the real estate market will be even more robust in 2016. 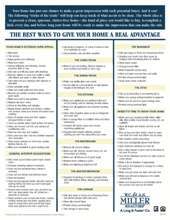 If you are selling, my free Homeseller’s Handbook provides helpful guidance for planning your strategy. I will identify those detail items that can enhance the presentation of your home and elevate it above the competition with my Checklist of items to give your home a real market advantage. If you are planning to buy, my free Homebuyer’s Handbook will help you evaluate the target market and identify home and neighborhood characteristics you want. We will review what is available and what is likely to come on the market, and I will provide access to the best home inspectors to help evaluate your prospective new home. Finally, if you have property to lease, now is the time to list it for occupancy within the next 2-3 months. “As either a buyer or seller, you receive Hill’s full attention. Hill has helped a range of clients exceed their expectations, working with first-time buyers, growing families, investors, builders, developers, empty-nesters, and individuals in transition with homes in all price ranges, from condos to single family homes to luxury estates. See additional testimonials at www.HillSlowinski.com. ← Start Planning Your Estate While You’re Young! You are the sources of many interesting questions that become the topics I post to this website. I hope these are informative and that I can serve as a resource that provides timely information to new and experienced property owners alike. Whether it is an in-town residence, vacation home, farm, commercial property, or resort, buying or selling or leasing real estate can be challenging. It is a complex contractual, marketing, legal, and financial process. You deserve the services of a full-time, dedicated real estate agent. I work very closely on each stage with you and advise you throughout it. I combine my training in law and negotiations with an in-depth knowledge of buyer and seller expectations, the requirements of each jurisdiction, neighborhood trends, and today’s market. Please send me questions or requests on the Greater Washington, DC area real estate market. I'll help you, and I will also address matters of broader interest to readers in this blog.